Africa We Care is a non-profit organization incorporated in Alberta, and recognized by Canada Customs and Revenue Agency as a Charitable Non-Governmental Organization (NGO) – Registration Number: 86065-3930 RR0001. Africa We Care is dedicated to the alleviation and total elimination of suffering in Africa. Africa We Care creates awareness, here at home, of the serious need for working in partnership with Africans to address the very urgent health, social and other issues that are negatively impacting their abilities to create a healthy, safe, secure life for themselves and their families. Africa We Care provides a welcome meeting place for newcomers from Africa. 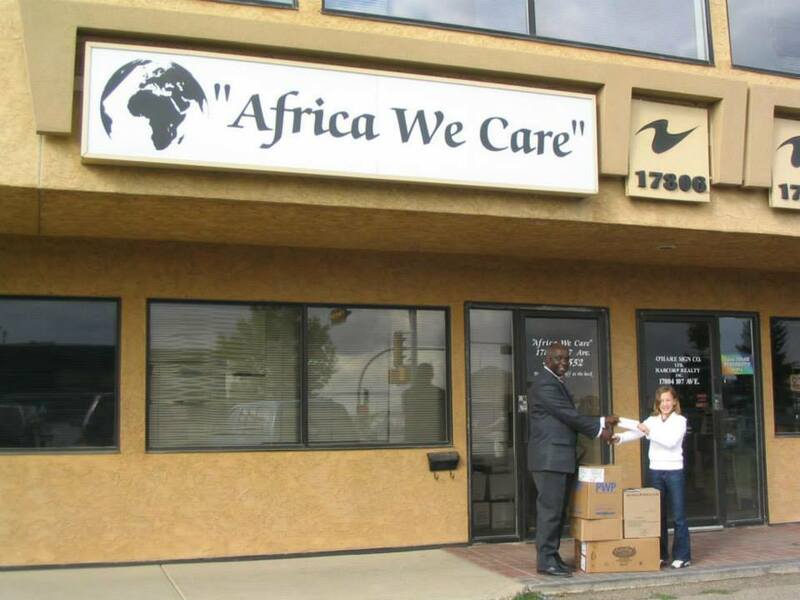 At Africa We Care, newcomers to Edmonton come to help themselves with articles of clothing like winter coats and boots, etc., and light household items. Our organization assists them in making the transition to their new lives and provides a forum where they can assist in addressing the serious issues back home and help build bridges to people in their new communities. Africa We Care provides a place where local people have the opportunity to volunteer their time, talent and financial resources, as well as make donations of used clothing, books, computers and other goods, which will be used to support the work of the partnerships formed to address the mission of Africa We Care. In addition to turning these no longer wanted items at home into valued commodities overseas, it will also save many of those items from filling our landfill sites. Africa We Care builds a model of operation that will create the funds required to maintain the core operation of Africa We Care and provide seed funding for key initiatives; and build a model that will encourage donations from individuals, groups and organizations, foundations and other granting bodies and funding from both the Government of Alberta (through the Wild Rose Foundation and other available avenues) and the Government of Canada (through CIDA) to fund additional partner driven initiatives. Africa We Care creates employment and job training opportunities for persons with disabilities, minorities and special groups as they lend themselves to helping the African people who are less fortunate than they are. Through the sorting and warehousing operations required to process the donated goods, they enhance their sense of self-worth and preserve their dignity as productive and contributive members of the community.